Every aquarium needs a thermometer. In fact, you probably already have a thermometer inside your tank right now. But have you ever given a thought to its accuracy? 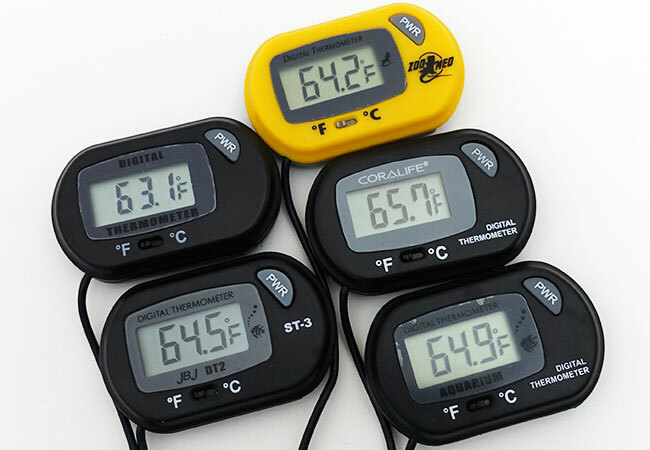 Five different thermometers, five different temperatures. For the record, the temperature being tested was an even 64°F (17.8°C). Yikes! And when it comes to thermometers, accuracy matters. If you cannot rely on your thermometer to give a correct temperature reading, then it’s as good as useless. What is the best and most accurate aquarium thermometer on the market? Want the answer? Then read on! What is an aquarium thermometer and do you need one? 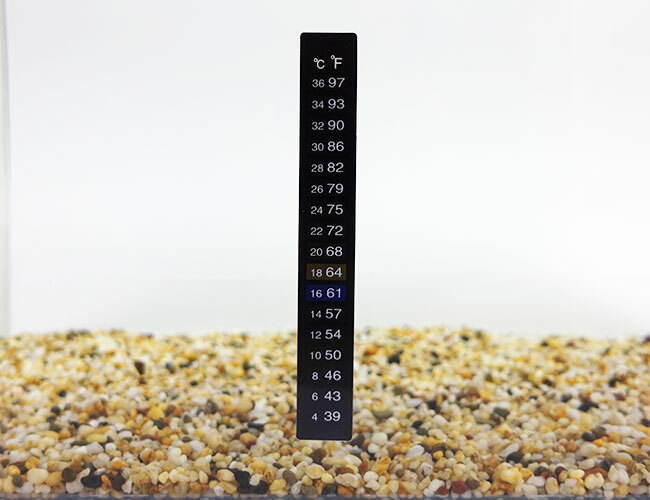 What are the different types of aquarium thermometers? Digital vs Analog – which thermometer is better for your aquarium? A tool that is used to measure temperature. In fact, you already use thermometers on a daily basis, whether it’s adjusting the thermostat in your home, determining if your roast has cooked properly or even checking your child’s temperature. As you have probably guessed by now, an aquarium thermometer allows you to accurately check the temperature inside your tank. This small device is an essential piece of aquarium equipment – if you own a fish tank, then you need an aquarium thermometer. It’s that simple! To you or me, warm or cold water looks identical. You can’t check water temperature just by looking at it. That’s where your thermometer comes in. It allows you to confirm that the water inside your tank is the right temperature for your fish. Typically, three different types of thermometers are commonly used for measuring the temperature inside aquariums. And as you will soon see, some are much better than others. 1. Sensor probe – Sits underwater, in your fish tank and checks the temperature. The probe can be moved anywhere inside the tank. 2. 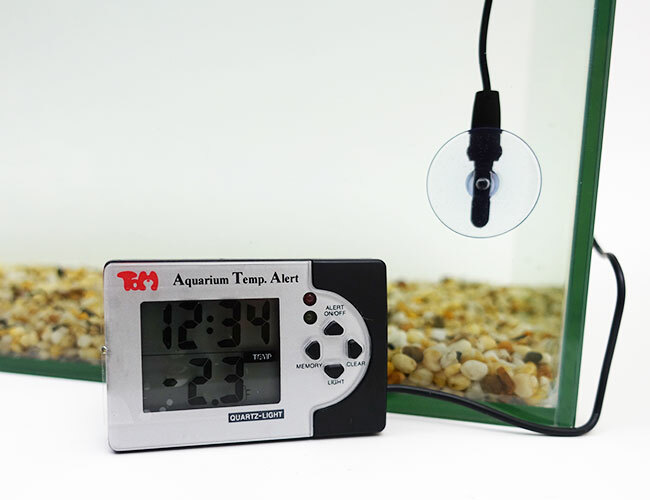 Digital display – Remains outside the water and displays the temperature of your aquarium. Also, it houses the batteries. The reason for the split design? Electricity and water don’t mix. By keeping the probe and display separate, the important electrical bits won’t get wet. If you want a thermometer that does not permanently sit in your aquarium, this is your best choice. Simply add the probe to your tank when you need to check the temperature and remove it when you are finished. Sometimes referred to as an instant-read thermometer, this thermometer is easily identified by a meter that attaches directly to the sensor probe. Dip the probe into your aquarium and in just seconds, the temperature will be shown on the digital display – similar to the pen-style thermometers that your mom uses when she checks a roast. Fixed-probe thermometers are small and take up very little space, allowing them to remain hidden from view in your aquarium cabinet until the next time you need to check the temperature of your tank. The downside? Fixed-probe thermometers must be held by hand. If you don’t, it will fall to the bottom of your aquarium. 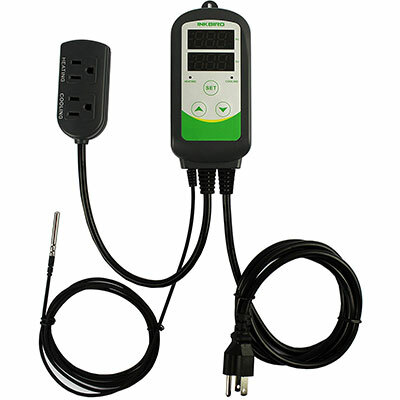 A probe is separate from the meter and attached with a cord. This allows you to set the probe up permanently in your tank while the meter sits on the outside, displaying the current temperature. An advantage to this is that the probe can be placed anywhere in your aquarium to continuously monitor the temperature. More advanced wired probes are also capable of sounding an alarm if the temperature goes above or below your desired setting. 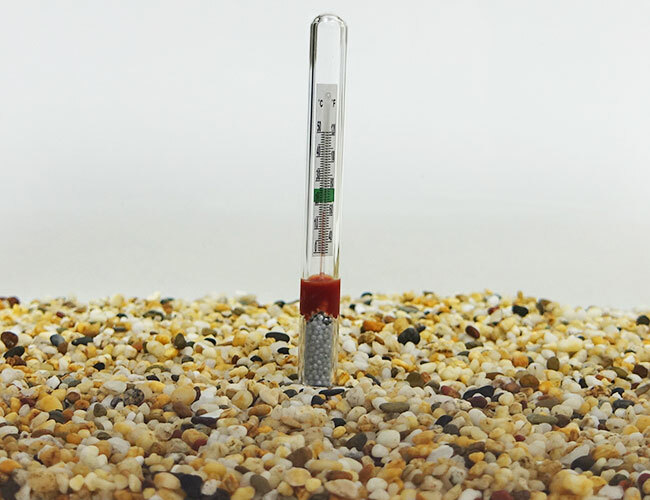 Submersible thermometers live under water with your fish and plants. These thermometers are designed to be left in your aquarium, allowing you to check the temperature of your tank by peering inside – a great hands-free way to monitor the temperature of your aquarium. The obvious downside to this is that these thermometers take up real estate in your aquarium. In a larger tank, this won’t be a problem at all. But in a small-sized tank, like one that many beginners keep betta in (although they shouldn’t! ), even a tiny thermometer can be too big. 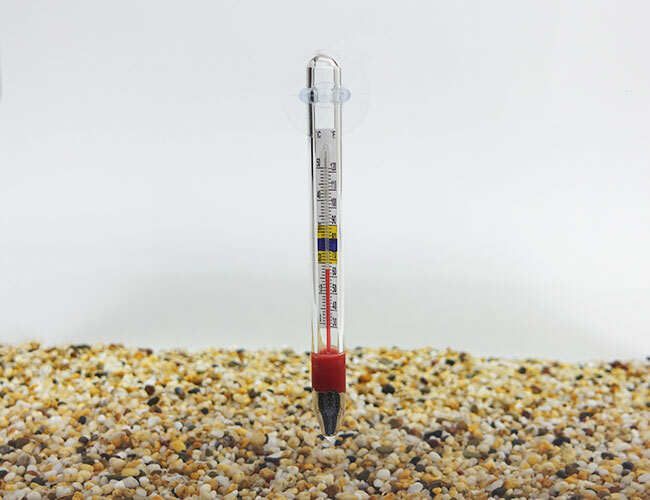 Submersible thermometers are most commonly made of glass. However, battery-operated submersible ones made from plastic do exist, although much less common. When it comes to aquarium thermometers, the submersible type was the cheapest on the market. In fact, you can pick one up for just a couple of dollars. Submersible thermometers are not recommended if you have an aggressive fish… You don’t want broken glass and alcohol in your aquarium! All told, there are three different types of submersible thermometers. However, some of them work much better than others. 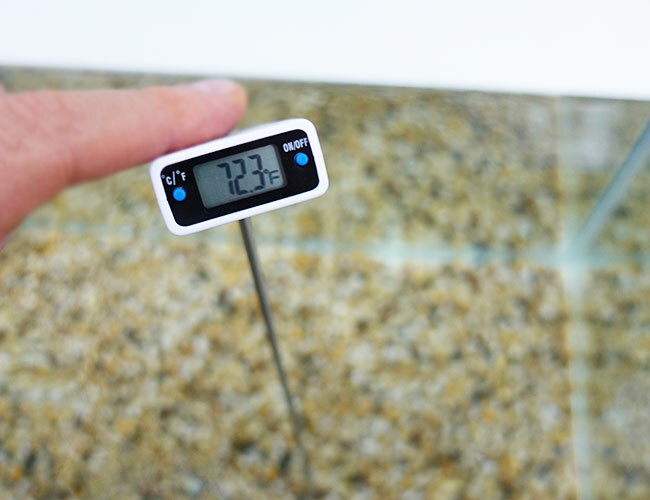 As the name suggests, this thermometer floats on the surface of your aquarium. Sounds like a great idea, right? By floating, the thermometer will take up less room in your aquarium. Unfortunately, it doesn’t work as well in practice. The smallest amount of water movement causes the thermometer to spin. The problem is that you can only read the thermometer front on. Many times during testing, I found that the reading faced the rear of the tank, making it impossible to read. And that was in a tank without any surface movement. I found that filters pushed the floating thermometers around until they became stuck in the corner at the rear of the tank. If you have background plants or decorations, then these will block your ability to read this thermometer. To put it simply, every time I wanted to check the temperature on a floating thermometer, I had to use my hand to turn it to face me so that I could read it. It just wasn’t practical. Now, all that’s left to do is glance through the front of your aquarium to read the temperature. I personally found the standing thermometer the hardest to read, especially when placed toward the rear of the aquarium. That said, if you have a smaller aquarium, this will hardly be an issue. I will add that if your curious fish bumps your standing thermometer, then you will have to dunk your hand inside your tank to set it back up. Out of all the submersible styles, this one is the best. By attaching the suction cup to the glass of your aquarium, you can be confident that your thermometer will be in the same place the next time you check the temperature. 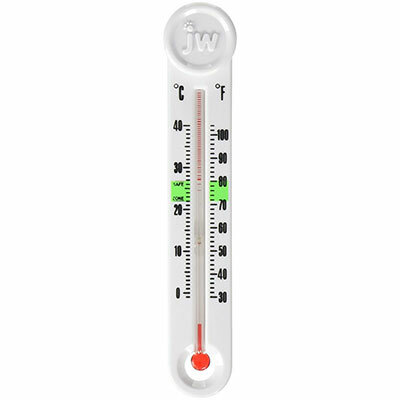 Best of all, you can attach this thermometer anywhere you want. Front glass, side or rear. You can even move it if you want to rearrange your aquarium. It’s funny to think that this is essentially a floating or sinking thermometer with a suction cup attached. But as you see, it makes all the difference. Don’t like suction cups? Some thermometers use a magnet, while others hang from the edge of your aquarium. But they are much less common than the suction cup variety. Even though it’s the best submersible type, in my opinion, a good suction cup thermometer is beaten by the meter and probe style thermometer. Stick-on thermometers are often referred to as LCD thermometers. LCD stands for liquid crystal display, which refers to the liquid crystal ink that changes color according to the temperature of your aquarium. Simply peel a sticker, attach it to the front of your aquarium, and it will detect the temperature of your water through the glass. I’ll level with you: I cringe when I see thermometers included in aquarium kits. You know, the ones that are aimed at beginners who don’t know any better. Most hobbyists agree that stick-on thermometers are not accurate. In the photo above, you see that the thermometer sticker strip indicates that the temperature inside the tank is between 86-90°F (30-32°C). However, when the temperature was checked against our test equipment, the temperature inside the tank was actually 77°F (25°C). Not even close, right? The problem? These thermometers are attached to the outside of your aquarium. That means that the temperature sensitive ink is affected by the temperature of the room. So, if your room is hotter or colder than the water inside your aquarium, then a sticker can give you an incorrect reading. This problem is worse for larger aquariums with thicker glass. A thermometer has one job. To accurately show you the temperature of your aquarium. If it can’t do that, then why are you using it? If you still want to buy a sticker thermometer, you should know that they have a limited lifetime – most thermometer strips fail after a year. Any thermometer where you need to match the temperature reading is called an analog thermometer. And, let’s face it, they are old-fashioned. Not when you can grab the reading from a digital thermometer in seconds. Part of the reason I prefer the digital variety is because my old eyes don’t like to squint at the tiny markings on analog thermometers. To me, it all comes down to precision. 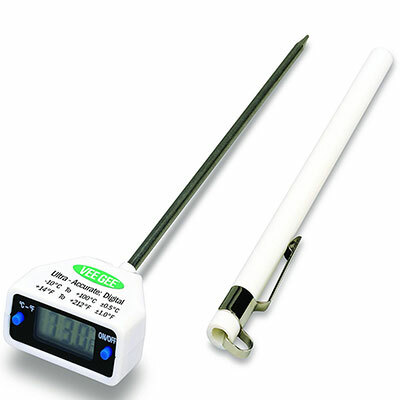 A digital thermometer can give you an accurate reading to 0.1°F. There is no guessing – you just read what’s on the display, and that’s your temperature. And many hobbyists agree, citing reliability and accuracy as the reason they prefer digital thermometers to analog. Not only that, but digital thermometers are made from plastic so that you don’t have to worry about a glass thermometer shattering inside your aquarium. Analog thermometers are a thing of the past. Do yourself a favor and buy a good digital thermometer! To accurately check the temperature of your aquarium water. In fact, it’s the only job that a thermometer has to do – if a thermometer can’t return a reading with any degree of accuracy, then it’s useless. So the first step was obvious: To test each thermometer for accuracy. After all, if you want to test for accuracy, you need accurate testing equipment. I wanted to recreate usage in a real-world environment, so I set up a 5-gallon aquarium, added one of my favorite aquarium heaters – the Cobalt Neo-Therm and heated the tank to an even 78°F (25.6°C). 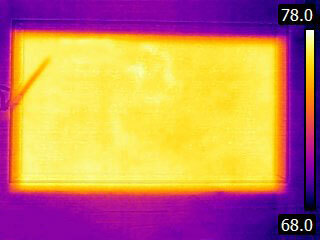 I used the thermal imaging camera to determine the correct placement of the thermometers I was going to test. This revealed an oversight I had made. 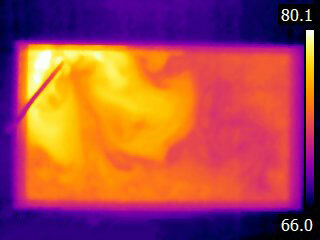 As you see in the thermal image taken from above the aquarium, there were noticeable hot and cold spots. While the water was warmer near the heater, it was cooler farther away. Obviously, this presented a problem: If I put my test equipment in a hot spot, and the thermometer I was testing in a cold spot, it would return a very different reading. Fortunately, this was an easy fix. I simply grabbed a spare Hydor Koralia I had kept aside for my reef tank. This circulation fan pushed the water around the tank, ensuring that it was more evenly heated. With the circulation fan in place, the temperature distribution of the aquarium was at a point where I was satisfied that I could achieve a conclusive result. Next, I added each thermometer to the aquarium, one at a time. I would then insert the probe from my meter and the liquid thermometer right next to it and compare the results. Ease-of-use is also important. I mean, an accurate reading is great and all, but what if it takes 15 minutes to achieve? I don’t know about you, but I don’t have time for that. Affordability also comes into play. There are accurate lab-grade thermometers that cost thousands of dollars. That’s well out of my price range. So once the most accurate thermometers were separated from the rest, usability and price were used to determine our top picks. Most of them are not that great. Now, this was a head-scratcher for me. My intention going into this guide wasn’t to just list the best of a bad bunch. I wanted to find the greatest aquarium thermometers on the market and narrow it down from there. So, I expanded the thermometers we tested to include laboratory stem thermometers and cooking thermometers, you know, the type that you stick into a roast to see if it is cooked? 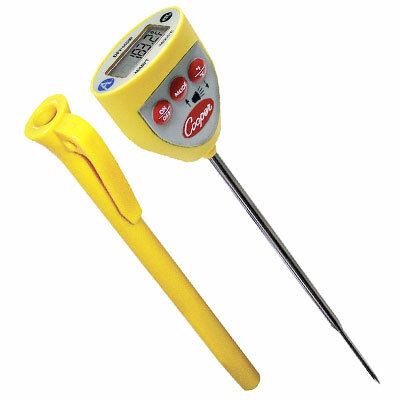 The reason for including these specific thermometers is that they need to be accurate and durable. Not only that, but these types of thermometers are often recommended by hobbyists and even sold in fish stores. With over 40 different thermometers tested, with aquarium usage in mind, I am confident that you will be satisfied with our top picks! I’ll be straight up, this was the hardest winner to pick. Having to choose a single winner from this many thermometers was not easy. But I feel confident that we have found the best aquarium thermometer for most people. Vee Gee makes lab equipment, so this thermometer’s accuracy was unsurprising. A quick dip in our aquarium returned the same results as our test equipment, right down to the degree, time and time again – in under a second! What was surprising was how much it cost. 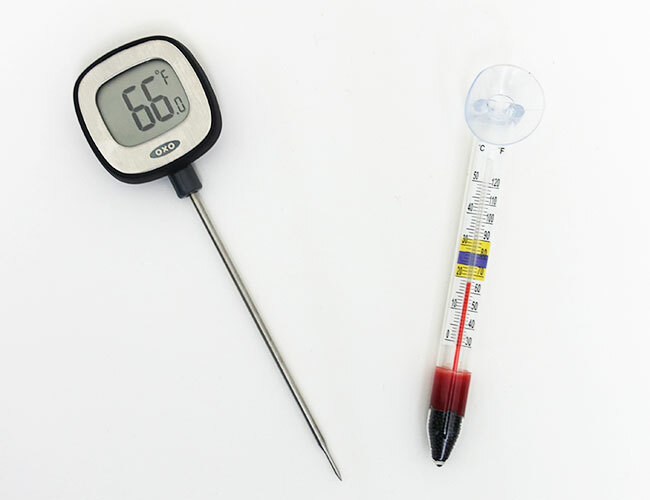 This thermometer is a steal and outperformed thermometers that were many times its price. Best of all, the temperature display is bends at 90 degrees – allowing me to easily view the digital display even when checking the temperature at the rear of my tank. Promising over 5,000 hours of use from a single battery and a power-saving feature that shuts the power off after 10 minutes means that you won’t need to worry about swapping the batteries out for a long time. It even has a sheath to protect the probe when not in use! If you have a deep reef tank and want to test the temperature near your corals, you will be pleased to know that a 12-inch long version is available. And, the stainless steel stem makes it suitable for saltwater aquariums. Coming in a very close second is the Cooper Atkins Digital Pocket Thermometer. This is the thermometer I previously used, before upgrading to the Vee Gee. I was pleased to see it held up well to the competition. There is a good argument to be made that since this thermometer is 100% water proof, it’s more suitable for aquarium use than our number one pick – accidentally dropping this thermometer in your tank won’t harm it. It even has an alarm that will sound once a preset temperature is reached. You will need to keep the probe of this thermometer in your tank for 5 seconds before it will accurately return a reading. I know it might not seem like much of a deal breaker, but tested alongside the Vee Gee, the delay was very noticeable. However, once held in place for a 5 count, it returned accurate results each and every time. Many of you will feel that this short delay justifies the added bonus of waterproofing. 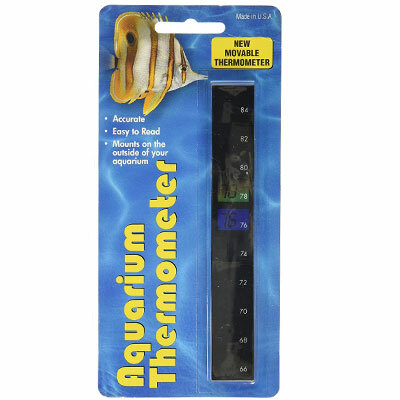 If that sounds like you, then this is the best aquarium thermometer you will come across. Note: Thermometer is rated at IPX7 – suitable for accidental dunks or rinsing under running water but cannot be permanently submerged. Surprisingly, the cheap glass tubes trumped every digital submersible thermometer I tested both in accuracy and usability. A problem with many of the glass thermometers I tested was that they were difficult to read from a distance. JW Smarttemp gets around this by using a plastic backing with large printed numbers. But my favorite feature? No suction cups. Instead, you use a magnet. The magnet made the thermometer easy to move around when cleaning the aquarium. And, I didn’t even have to get my hands wet! Best of all, the price is around $6. It goes to show you that a good thermometer doesn’t have to cost much. A great choice for beginner tanks who do not need the accuracy of a probe thermometer. Okay, so it’s not technically a thermometer, it’s a temperature controller – essentially a thermometer on steroids. You see, this device monitors the temperature of your aquarium. Too hot? It turns you’re your heater off (and chiller on, if you have one installed). Too cold? It does the opposite – keeping your aquarium at the perfect temperature. The reason it won this category? It’s wide range of alarms. Not only can you set high and low temperature alarms, but there is also a built-in alarm to alert you if the sensor probe fails – something that your typical thermometer doesn’t offer. For saltwater tanks, a thin coating of aquarium-safe silicone over the sensor probe will stop it from rusting. If you just want an alarmed thermometer, the Lifegard Aquatics Digital Temperature Alert is what you are after. While it worked well enough during our tests, it isn’t entirely aquarium suitable, which is why it did not win this category. Many users report that splashes of water and humidity cause this device to break. It was also more expensive than our top pick. Please note, we are currently doing an indepth review on heater controllers, this recommendation may change. Like I said earlier, thermometer stickers are the least accurate type. I don’t recommend them and suggest you choose any other thermometer that I recommended above because they are all great. But no matter how many times I advise against it, some of you will buy a sticker thermometer anyway. And considering that it was obvious that some stickers performed much better than others, I would prefer you buy one that has something going for it, rather than an outright dud. Aside from inaccurately displaying the temperature, usability varied dramatically. On some, the color change was difficult to see. Others had a less precise scale, with increments of 3 instead of 2 degrees. It might surprise you to learn that this was the only thermometer sticker that could consistently return an accurate reading across a variety of water temperatures. Not only that, but the color-changing ink was bold and easy-to-read. I also appreciated that it came in different styles, allowing the sticker to be mounted horizontally or vertically. Upon further investigation, it is unsurprising that LCR Hallcrest beat out the competition. It turns out they focus exclusively on color-changing technology. Best of all, they make these thermometer strips right here in the USA. If you must buy a thermometer strip, then this is as good as it gets. And don’t forget to replace it before the year is out… Like most thermometer strips, this one is only good for one year. However, none of them were any good. All up, I tested 6 digital thermometers in this style and not one of them returned the same temperature reading. Despite the lack of accuracy, this is the most popular digital aquarium thermometer sold on Amazon, check it out! Despite its popularity, I couldn’t even get two Zacro digital thermometers to return the same result. No matter what I did, they were out by 2°F. Hardly reassuring. Even digital thermometers and probes with a different design struggled when it came to accuracy. The Lifegard Aquatics Little Time or Temp would randomly fluctuate while the Marina Aqua-Minder showed a reading that was 6°F higher than the actual temperature, making it the worst performing thermometer we tested. Next up, there were the 2-in-1 digital aquarium thermometers. These thermometers could measure the room temperature as well as the temperature inside your tank at the same time. If you use two thermometers to perform the same task, I can see why a single unit would be appealing. However, both the Fluval 2in1 and the Lifegard Aquatics Digital Temperature Alert had flaws that would prevent me from recommending them. Lifegard Aquatics’s model had frustratingly vague instructions and was overly expensive while the Fluval 2in1 didn’t measure the temperature inside the tank, it instead measured the temperature of the glass. Interestingly, despite all these being advertised as aquarium thermometers none had a waterproof LCD display. 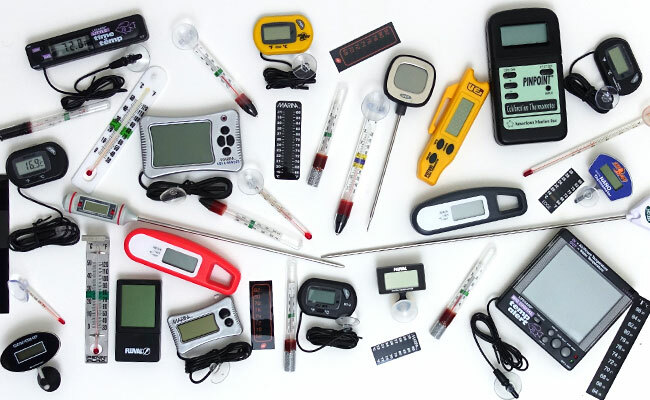 If you accidentally drop any of these thermometers inside your aquarium, they will stop working – only the sensor probe can be placed inside your aquarium. 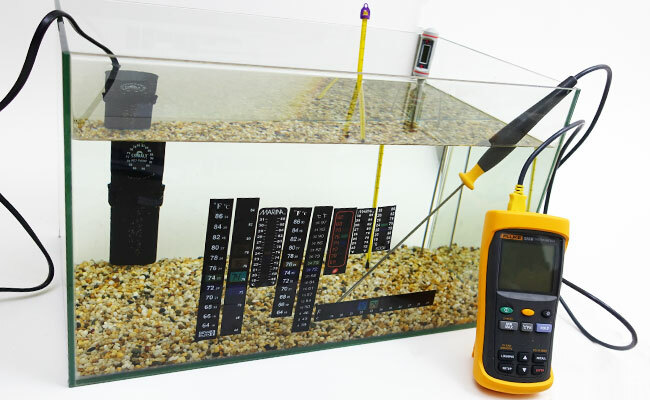 While there are digital thermometers capable of being completely submersed, such as the JBJ Digi-Temp and the Fluval Submersible, I don’t like the idea of dunking my hand into my aquarium every time the battery dies. Speaking of which, many reviews complain that both of these products have an overly short battery life. My lukewarm response to these ‘aquarium’ thermometers caused me to expand my search into industrial food and lab thermometers – all of which performed much better! On the lab front, the Thomas Traceable Long Stem Thermometer came with a calibration certificate and could have been our top pick. However, having to tilt my head to read the horizontal display coupled with the price saw the Vee Gee thermometer take the top spot. Likewise, the Taylor 8215N and Vee Gee Soil Thermometer also consistently showed accurate temperatures, but I passed them up due to the analog dial. The UEi Folding Thermometer was another excellent choice that was only let down by its short probe length and horizontal reading. On the cooking side, the Lavatools Javelin showed that it was right at home testing aquarium temperatures, and it’s splash-proof to boot. The waterproof Cooper-Atkins also performed well. However, both were edged out by my top picks. While Marina made some of the most popular thermometers, like the Marina Floating and their Marina Floating Deluxe, both were difficult to read thanks to a dark-colored “safety zone” marking on the temperature gauge. I appreciated that the Marina Stainless Steel Thermometer could hook onto the glass edge of your aquarium, allowing it to neatly hang. However, plenty of reviews report rusting after just a short while. 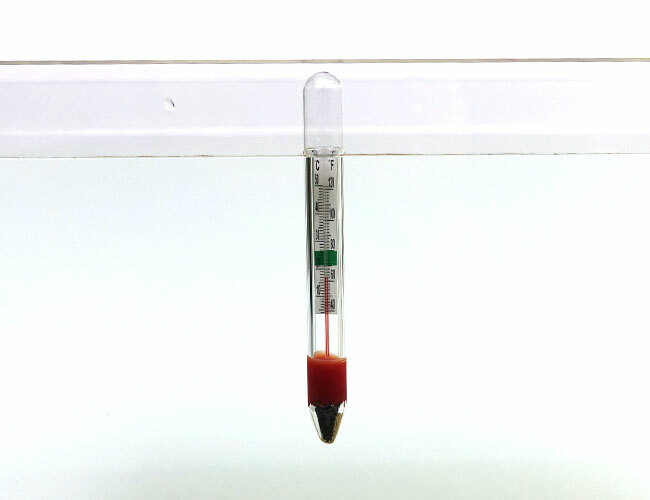 While there were smaller glass thermometers that took up less room, such as the Fluval Nano, the Deep Blue Tiny Temperature is even smaller. So small, in fact, that the temperature scale can hardly be read. As you see, under controlled conditions, the accuracy of aquarium thermometers varied dramatically – not what you would expect given the important role they play in fishkeeping. 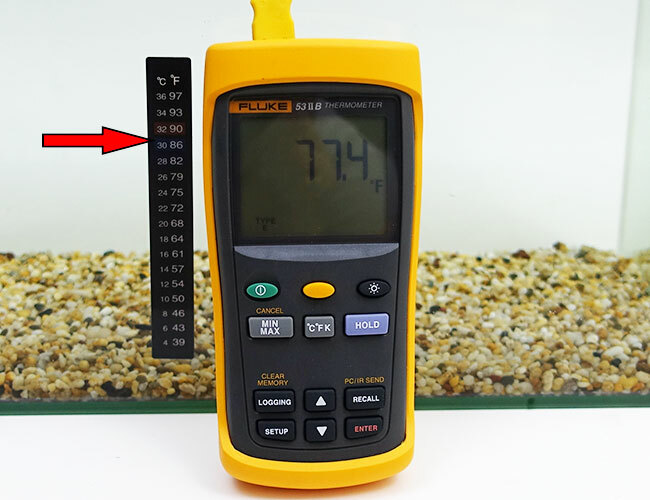 Armed with our top picks, you now have all the tools necessary to easily take an accurate reading of your aquarium’s temperature. What thermometer do you use in your aquarium? Let me know in the comments below! Thank u so much for this article. Now to go buy a Vee Gee! And on to your next article. I’m glad I could help. If you are not clumsy, and don’t need water proofing, then the Vee Gee is something else. Since doing this review I have happily made the swap – I still don’t regret that decision. Hi, I’ve had a glass thermometer break in my tank and I’m wondering what the balls are made of, I have tried scoping the internet but to no avail. Having examined these thermometers up close, It’s likely either lead or a magnesium-zinc alloy. Be careful handling it and don’t swallow any. If it’s lead, you don’t really want it in your aquarium. I can’t thank you enough for this review. Nowadays it is difficult to find good ones. I am concerned about probe style thermometers going from tank to tank and spreading any disease. Any suggestions on how to clean it after use? Thanks for the lovely feedback, these days most reviews seem to have never actually used the product themselves. I can see why, these reviews are very expensive, this website is very much a project of love for me. As for spreading disease, many fishkeepers use either a potassium permanganate or isopropyl alcohol dip followed by a rinse in fresh water on things like nets that get shared between tanks. Like Sarah, I use an IR Etekcity 1080. I originally bought this for water changes to get the bucket to temp. I now use it all the time. I turned off the laser pointer as that seems better for a tank. I never point it at glass just about 4-6 inches above the water. It is as accurate as others I have. On my 110 L (29 gals) tank I use an Ink Bird controller. It is fantastic as it keeps the temp within 0.1C. I bought this more as a safeguard for heater failure as I met someone who’s heater thermostat failed and the fish was cooked. He managed to save just one angle. I could not agree more about those stick on things totally useless. Just found this site and the information in here is great. Thanks. Thanks for the feedback, especially your success with IR thermometers. We will definitely go back and re-test IR thermometers when the time comes to update this guide. However, whether shooting through the glass or top down on our tanks, we couldn’t match the results to our test equipment with either model, no matter how much we played with the settings. Completely agree with you on the Ink Bird, it’s one of those products that you hope you never need. Prior to owning one, I used two smaller heaters – If I needed a 400W heater then I would use two 200W ones. That way if one got got stuck on, it could not get hot enough to cook the fish. Similarly, if one failed completely, the water temperature wouldn’t drop as much. Thanks for the feedback. I am glad you the Vee Gee thermometer is working out well. Just like you, I made the swap too after seeing how well it performed in this review. I bought the Vee Gee based on your recommendation. THANK YOU SO MUCH. It’s so much better than the sticker thermometer I was using before. Good guide. Agree on using dipping thermometers. I have used cooking thermometers my whole life. Will try Vee Gee to replace my broken one. Thanks for advice. Thanks for the feedback. I completely agree with you – probe style thermometers that you dip in the tank are the way to go for both accuracy and ease of use! I use an IR thermometer. The one that measures with the red dot. What about those? 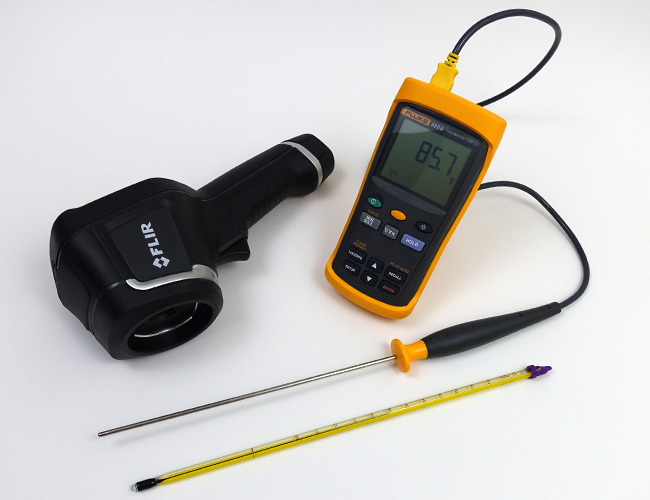 We have tested two infrared thermometers, the Fluke 62 and a cheaper Etekcity 1080. While these thermometers were accurate on solid surfaces, they were consistently a couple of degrees or more out when used on an aquarium. Our guess is that the infrared thermometers measured the temperature of the glass, substrate or decorations inside the tank rather than the water. So while it may be a good way of getting a ball-park temperature of your aquarium, an infrared thermometer isn’t as accurate as our recommendations in this guide. What about Top Fin Thermometers? What do you think of THOSE? While I appreciate that Top Fin thermometers are commonly available, and can be grabbed at any Petsmart, I do not recommend them as an accurate thermometer. Hi, I need a good thermometer for my 10 gallon tank. What do you suggest? 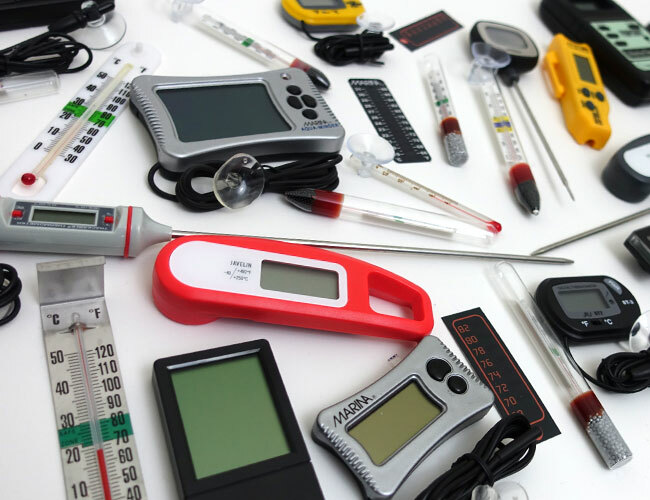 It all depends on whether you want a thermometer that goes on the inside of your aquarium, on the outside or one that you dip in every now and again. We have listed what we believe to be the best of each type in the guide above – all you need to do is choose!